Microsoft introduced its wireless laptop mouse, Mobile Memory Mouse 8000 lately. Featuring a combination of chrome and black exterior casing, the design of Mobile Memory Mouse 8000 is futuristic and simplicity in itself. It is sizeable enough to fit in your palm comfortably. The innovative ergonomic design allows users to work in total comfort, with finger grooves and thumb scoop to help make navigation smoother. Besides all these design features, the most attractive part of this advanced mobility tool is the unique transceiver which can perform multitasking. The transceiver will connect with the mouse in transmitting signals. On top of that, this transceiver also comes with built in flash memory of 1GB. Users can use the built in flash memory to back up or transfer files. 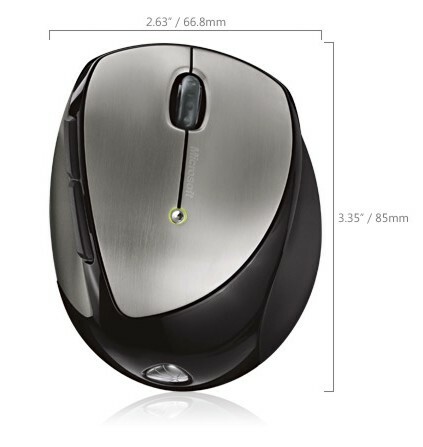 Users can enjoy using the wireless mouse and flash drive together and this only takes up one USB port. It will free up other USB ports for users to run other USB devices such as MP3 player, printer, digital camera, etc. The transceiver is also a fully functional flash drive, so you can store and transfer files and free up USB ports. The 2.4 GHz wireless USB mini-transceiver connects wirelessly right out of the box with virtually no interference, and up to 30 feet of wireless range. You won’t get caught with a dead battery—the Battery Status LED Indicator glows red when the battery is running low. Get quick access to the media, programs, and files you use most often with customizable buttons. Easily flip through all open windows with Flip 3D. Too many open items on your desktop? Click the scroll wheel button to instantly display your open windows, then point and click to select. Mouse design is optimized for right handed users. Save time and effort with the scroll wheel—navigate documents and Web pages without using the on-screen scroll bar. Turn your 3-in-1 device off to extend battery life even longer. A switch on the bottom of the mouse enables Bluetooth notebook users to connect directly to their PC without using the included transceiver. Compact and comfortable, our handy notebook and laptop products are designed for convenience and mobility. Give yourself room to move—wireless mouse and keyboard products let you work without worrying about tangled wires. A battery status indicator flashes when batteries need recharging.